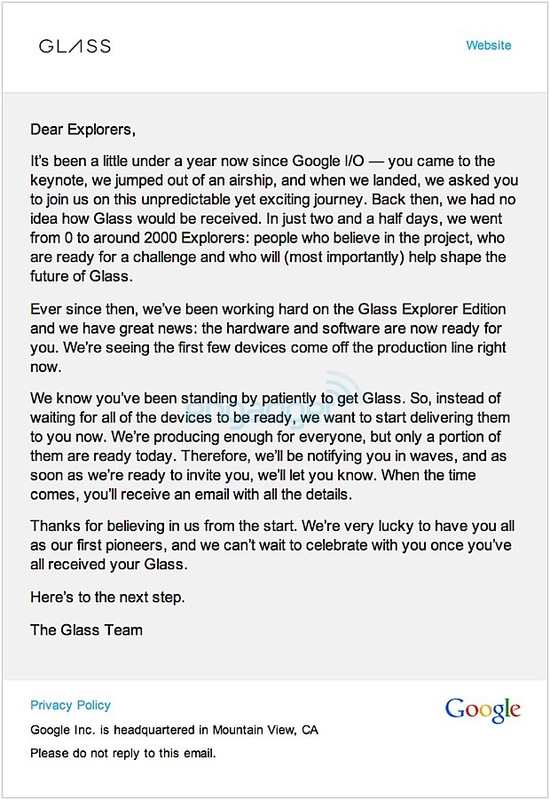 Google just shot out an email to folks who signed up for its Glass Explorers program at I/O last year, and it's spreading word that Glass units have begun to roll off the production line for participants. The roughly 2,000 devs who pre-ordered the spectacles won't be getting them all at once, however, as Page and Co. say they'll be delivered in waves. Mountain View notes it could have waited for every unit to be ready, but decided to send them out as they're made to speed things up. Presumably, winners of the #ifihadglass contest are in line to receive theirs after those who attended the developer powwow, and they'll have to travel to Los Angeles, New York or San Francisco to pick them up. Hit the break to live vicariously through the search titan's guinea pigs adventurers by reading the email in its entirety.